In class I try to avoid opinions. In the short run, many of my lambs will remain confused. It is not my job to convince Amanda that Neil Armstrong walked on the moon--as soon as I use my position of authority to make a point, I've lost my chance to teach a child how to think. It is my job, however, to make them skeptics, to have a sense of what we do not know, to suspend judgment while using their God-given senses and rationality to come to their own conclusions, conclusions that might change should new evidence become available. As a result, I fear that some day a mother will tell my principal that I did not vigorously dispel the notion of aliens, of rigged moonwalks, of the impending doom 3 short years away. I would be impressed if the box swelled up with rising temperatures, or shrunk when a high pressure weather system passes through. But it doesn't. 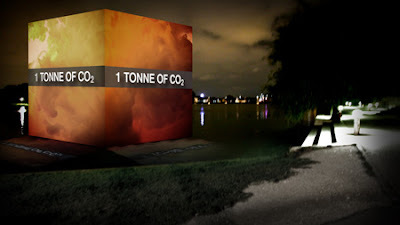 A reporter or two has mentioned that the cube represents the volume of CO2 at standard pressure--but fail to mention temperature. Maybe the ideal gas law is too complicated to discuss. If you want to show children how much a ton of carbon dioxide weighs, show them the solid product of a very common reaction. Show them a block of oak, a cup of sugar, or a bowl of salad. Ask them where most of the plant "stuff" comes from. Take them outside and show them your town's largest oak tree. Comes from the same stuff. The oxygen comes from the water, it turns out. All the carbon dioxide ends up in the wood. You can show this in class. I keep a propane torch handy. Light it, briefly aim the flame at something cool and non-flammable (the faucet on my desk makes a good target), and see the water vapor fog up on the object. It amazes me every time. Water from fire. Technology gives us power, but not principle. Power without principle, knowledge without wisdom, will spell the end of our species, though perhaps not through global warming. There may be a reason intelligence per se is not an adaptation found in most species. Life has been around for here for over 3 billion years, and I've no reason to believe it won't be around for billions more. I know I won't be around to see it. It would be nice, though, if one of my descendants does. The cube photo is all over tarnation,this one from LA Curbed, which credits Obscura Digital. 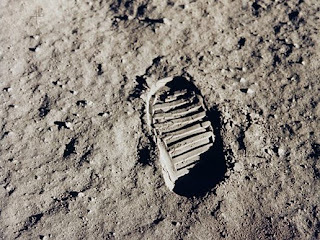 The footprint is from NASA, and is in public domain. And this is my 400th post here--go me! I've just been reading Classic Feynman (rereading parts of it for the umpteenth time). Your comment about power, but not principal rang strong in my ears as it seemed to echo his thoughts. I'm a scientist and I know what constitutes proof. But the reason I call myself by my childhood name is to remind myself that a scientist must also be absolutely like a child. If he sees a thing, he must say that he sees it, whether it was what he thought he was going to see or not. 'Science gives us knowledge, but not wisdom. Politics gives us plenty of posturing but few solutions. Another bleak generalization about the future of our planet? Your point about avoiding opinions - I've thought long and hard about this, for decades. The fact is that Science is all about opinion. Fact. It's how opinion is assimilated that brings about an understanding of what Science is. It's in learning how to form an opinion that makes a would-be scientist skeptical. I always revert to the conundrum of the model for light - that it behaves as if . . .
. . . and we can bring forward models, based on opinion, to explain in metaphorical ways how light can be regarded. But without skepticism that you mentioned, and an ability to form an opinion, the learner can neither understand what great minds have seen, nor can they contribute to Science by putting forward better models. Your ability to bring your students' stories to life beyond their neighborhoods makes the words "illegal aliens" sound harsh (which, of course, they are). You raise a good point about the "illegal" part. I love Classic Feynman! It's been a few months since I've read it, but Feynman has influenced me, maybe more than I realize. I'm not sure original thoughts exist in anyone's head--but your wide range of quotes continue to entertain me (and others), and sharing universal human truths (with its concomitant irony and humor) is always appreciated. Imbolc is just 6 weeks away now. Do your kids know you call them "solar babies"? I have faith that life will survive whatever stress we manage to create. It is my hope that humans survive, as well, but that may require a larger act of faith than I can muster. Live for today, and act for tomorrow, I guess. What else can we do? Science is based on opinion insofar as it is based on stories. What separates science from opinion, however, is the shared rules for this particular kind of storytelling--all models hinge at some level on observable phenomena. Of course, scientists do have different opinions on how to interpret data at times. Best of the season to you, and everyone else as well. It's a joy to have people come by and comment here.